Awkward Moment Or Red Flag? 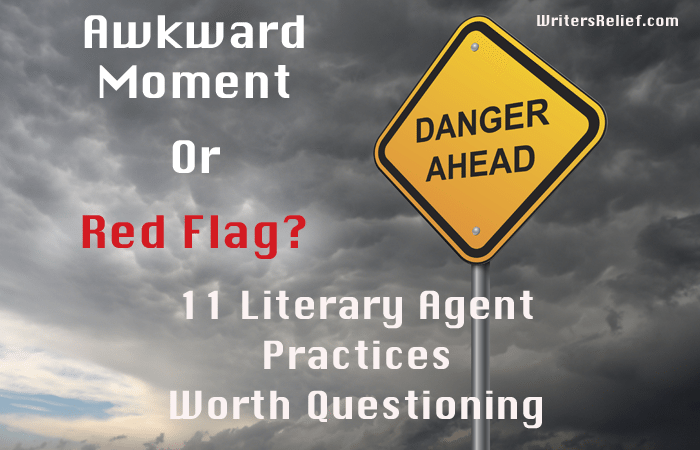 11 Literary Agent Practices Worth Questioning - Writer's Relief, Inc. Some literary agent practices are honest and aboveboard. Others fall into an awkward, ethical gray area—and some of these practices should send writers running for the hills. Here’s how to make sense of questionable literary agency practices when you’re not sure what to do. Charging reading fees. Some so-called “literary agents” require reading fees from all writers who submit. We’ll put it this way: reading fees are bad, bad, bad. Reputable literary agents make their money by selling books, not by charging to read your work. The verdict: RED FLAG. Taking a long time to respond. Unfortunately, it’s not unusual for writers to have to sit tight and fret over delayed responses. Here’s how to nudge an agent about a submission or how to get more attention from one. The verdict: AWKWARD MOMENT. Not offering a written contract. Very few literary agencies will forgo a written contract. A contract will protect your rights much more than a handshake will! Ask for a contract. If you don’t get one, reconsider the partnership. The verdict: RED FLAG. Recommending revisions (with fees). Some literary agents will respond to manuscript requests with a note saying, “We like this, but you need to revise. Here is the name of a freelance editor” or, “Here are our critique fees.” Sometimes, the advice is truly well intentioned. But other times, the agent is just looking to score an affiliate commission or business on the side. Do your research on literary agents’ reputations. The verdict: AWKWARD MOMENT that could be a RED FLAG. Advertising. Most reputable literary agencies get more business than they can handle through the legitimate writers market listings that can be found on the Internet and in bookstores. The verdict: RED FLAG. Targeting poetry and story authors. Be suspicious if any agent promises to make you a lot of money by selling your poems or stories to literary journals or magazines. The verdict: RED FLAG. Withholding the names of editors who have seen your writing. You ask your literary agent for the names of the editors who have seen or will see your book project—and you’re told to back off. The question to ask is: Why is your agent withholding this vital information? Take a moment to assure him or her that you won’t contact editors on your own, then ask again. If the agent still doesn’t offer the names, it could be cause for concern. The verdict: AWKWARD MOMENT that could be a RED FLAG. Not offering copies of editors’ responses. If you ask to see copies of responses to your submissions and your literary agent refuses to comply, you should be concerned. The agent could be misleading you about editor responses and whether submissions were made in the first place. That said, some agents just don’t like to share their personal correspondence. And other literary agents handle manuscript follow-ups on the phone, not in writing. The verdict: AWKWARD MOMENT that could be a RED FLAG. Bundling. Some literary agents send more than one book project to a single editor at one time. As a result, the editor can feel as if the agent hasn’t really taken the time to learn which of that handful of books is the one the editor would be interested in publishing. The verdict: RED FLAG. Asking you to sign a challenging literary agency contract. If your potential agent is willing to negotiate within reason, great (that’s what agents do!). But if your agent has refused to compromise, you might be looking at a difficult working relationship ahead. The verdict: AWKWARD MOMENT. Offering to publish your book for you. There’s a lot of controversy around literary agents who publish their clients’ work. You’ll have to make a personal decision about literary agents who are also publishers. The verdict: AWKWARD MOMENT. Should You Fire Your Literary Agent? Sometimes, it’s hard to know when to break ties with a literary agent. If your literary agent is displaying any of these signs, it may be time to think about parting ways. QUESTION: Of these 11 practices, which do you think is the worst? ← Love Print Books? Then You’ll Love This News! I almost always ask for revisions, and if you ask, I might suggest resources. But I don’t care how you get there, as long as you get there. As for bundling, I only submit to editors who I personally know and who know me. So they (generally) don’t mind if I pitch more than one project at a time. You WANT an agent who has those relationships. Thank you. This was especially helpful. I self-published my first novel, but planned to use an agent for the next one. This article will help me make a better decision. I went through a host of agencies before I published my book. I tend to consider any agency who makes the majority of their money by adding on services as not totally on the up and up. Then there are some agents with questionable practices such as requiring you to sign a contract turning over certain rights to them or paying them an enormous percentage of royalties. See an attorney before signing any contracts.